How can I best dry homemade extruded pasta? I've been experimenting with extruded pasta. I want to try to dry it so I don't necessarily have to make it the same day as cooking it. Once extruded, how long should I leave it out to dry? Afterwards, can I simply store the noodles in a container, or do they need to be stored in the refrigerator? I'm just using flour and water for these noodles, no eggs. Though I've never dried extruded pasta. I regularly make and dry out cut pastas like fettuccine. I prefer egg based pastas, as they're richer. I dry mine at room temperature in nests. Even with the egg I've never gotten ill. This is how my great grandparents had done it. So I'm fairly certain its very uncommon to become ill from the conditions you dry the pasta in. Especially since you aren't using eggs, I doubt you'll have a problem when it comes to food safety. Most drying methods are done at room temperature. I'm assuming extruded pastas take a bit longer to dry, but I don't think this is going to be an issue. The only time I have trouble with pasta is when I put it in a ziplock without properly drying it. This pasta will mold, and its pretty easy to spot. I'll leave pasta to dry for more than 24 hours before I put it in a plastic bag. Even then I keep the bag only half sealed for the first couple days just to be sure. Really the drying period is what would worry me. I'd be worried about it being dry enough before storing, than I would be worried about it molding or spoiling while drying. Which you don't really need to do. Small insects tend to enjoy flour, so storing in a tuperware container with some cheese cloth over the top might be a better approach, as it allows moisture to escape. I wouldn't be so much overly worried about bacteria, as these will be killed in the cooking process. However, mold, even when killed, is still dangerous. Throw out any moldy pasta. It won't go moldy unless you store it airtight while its still damp. Simply put, dry it thoroughly, and you don't need to worry about spoilage. 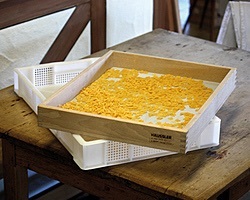 The dried pasta will easily last for months. If you're going to cook it the next day, you can even just refrigerate it without drying. As drying thoroughly might take longer than the period of time between prepping and cooking. If you're prepping a few days or more ahead, drying would make sense. It's very common to dry pastas at room temperature, and there isn't any safety regulation against doing so even if your pasta has egg in it. Doing so in a cooled environment is just an added precaution. However, I've made and dried pasta for years without any ill effects of doing so at room temperature. Dry it thoroughly, it should be bone dry. At least 15 hours(it's humid here, so I do at least 24hrs in summer). Use your best judgement. It takes a long time to dry, so making in larger quantities less often is often prefered if you're prepping for short order. Don't store it in an airtight container, but something that can breath but doesn't allow insects/debris to come in contact. Remove any excess flour that could trap moisture. Over the years I have extruded pasta hung on poles and let dry for 12 to 24 hours. Room temperature and humidity is what it's all about I have found that on humid days the pasta dried slower and was very strong. On low humidity days it would break and not be strong at all. I haver extruded over 100,000 pounds using semolina eggs and water. Weigh your eggs and water every batch cause your eggs will weigh different each batch. If you adjust your water by very small amounts it makes a huge difference. Extruded pasta dried is the best pasta you will ever eat. Place the fresh pasta in a single layer and dry them for as long as neccessary until they are completely dry. It's impossible to give a precise time frame because environement factors like humidity and temperature vary with wheather and seasons are nearly impossble to control at home. Otherwise, the same rules aply as with all drying projects in your kitchen: Ensure good air flow, keep humidity as low as possible (better cool and dry than warm and humid...) and as an optional step, turn your pasta occasionally. Once fully dry, they can be stored like store-bought dry pasta. If in doubt, consider paper bags in case there are traces of moisture left. For more on this, see this question. This question is among the most difficult to nail down for home pasta makers. Marc Vetri, Philadelphia chef and pasta guru, recommends allowing extruded pasta to dry, uncovered, in the refrigerator. The idea is to allow it to dry...but slowly. So, perhaps a couple of days at refrigeration temperature. Not the answer you're looking for? Browse other questions tagged dough pasta drying or ask your own question. Why does my dough always need more water than the recipe calls for? How do you dry homemade pasta so that it stays straight? Why is my fresh pasta tough? How can I make my pizza dough easier to work?